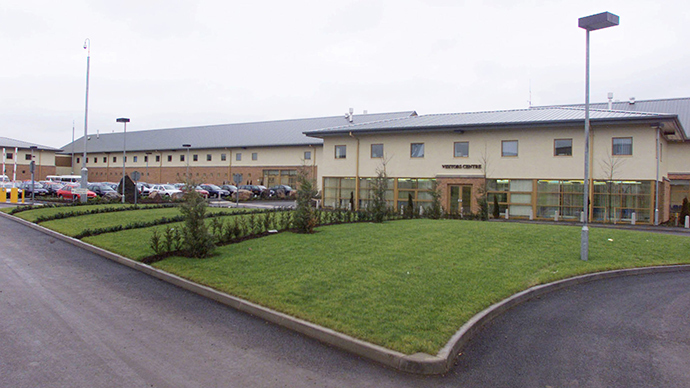 Detainees at Yarl’s Wood immigration removal center have gone on hunger strike in protest at the treatment of a female inmate whose husband died there on Monday. Dozens of detained migrants are refusing to eat until Bhavisha Ben Patel is released. Bhavisha’s husband Pinakin, 33, died inside the facility on Monday after suffering from shortness of breath. He was forced to wait 15 minutes before healthcare staff tended to him, according to the Independent. The Patels were detained after arriving in the UK from Gujurat, India, on holiday more than two months ago. “We planned a 10-day break, visiting family friends and a trip up to Scotland,” Bhavisha told the Independent through a translator. Bhavisha carried copies of her qualifications along with her travel plans because she wasn’t sure what papers she would need to enter the UK. Guards from the UK Border Agency interpreted this as a sign the couple intended to stay in the country and find employment. The Patels were refused entry and detained at Yarl’s Wood immigration removal center. Despite offering to return to India, Bhavisha says the couple was told they would be held until their case had been processed. A spokesperson for Serco, the private contractor which runs the facility, described the death as “very sad,” but refused to comment further until after the inquest. Despite previous damning criticism from former detainees, Serco’s contract at the detention facility was renewed by Home Secretary Theresa May for another eight years last November. Yarl’s Wood came under the spotlight last month after a Channel 4 undercover film revealed guards using offensive language to describe the detainees, most of whom are women. In one scene, guards discuss going into women’s rooms while they’re changing. Former Yarl’s Wood resident Juliet Nantambi, 35, spoke to RT about her three-month detainment in the notorious facility. Nantambi called for the detention center to be closed, arguing there is little risk the inmates would ‘abscond’ into society given the limited rights they have in the UK. “It breaks my heart to learn that they are only looking out to improve the service. It’s a prison,” she told RT. A group of influential MPs called for an end to the indefinite detention of migrants in a report published in early March. The cross-party inquiry said they were shocked by the horrific testimonies of current and former inmates, some of which described suicide attempts and sexual harassment. “Yarl’s Wood is not a prison, but an immigration center which has a duty to protect the most vulnerable,” Labour MP Keithz Vaz said in a parliamentary debate which followed the report’s publication. “Instead of being protected, detainees are verbally abused and poorly treated. This is not the first time that Yarl’s Wood has been the subject of parliamentary criticism,” Vaz, who is chair of the Home Affairs Committee, added.